A-PDF to Flipbook Pro for Mac is a stunning animation flipbook maker. 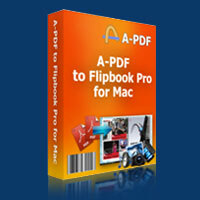 Just as its name suggests, this page flip program can publish flipping PDF book from PDF on Mac devices. In addition to helping you to turn PDF to page turn book, this software allows you to edit pages with inserted links, embedded multimedia and more. And you can customize the book style with a series of configurable settings based on the beautiful template. A-PDF to Flipbook Pro for Mac is perfectly compatible with Mac devices: Mac OS X Leopard, Mac OS X Snow Leopard, and Mac OS X Lion. A-PDF to Flipbook Pro for Mac is quite user-friendly. It takes just four steps to output striking PDF page turn book: Import PDF—Edit pages—Customize on template—Select output format to publish flip book. All these will take you only several minutes. 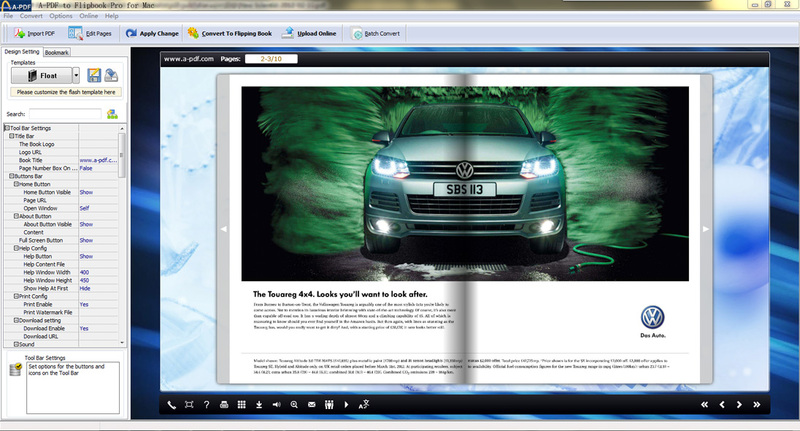 "Edit Pages" application allows you to add multimedia, links, buttons and printable area to any page you like. 1. Embed video or flash (FLV or SWF format) or YouTube video. 2. Add sound file (MP3) to play music. 3. Add image and select an action type. Insert internal links (page links) and external links (website links and e-mail links) to improve user experience. Add printable area and your readers can print it out as coupon. There are 10 languages for you to choose: English, Chinese, French, German, Arabic, Japanese, Greek, Hebrew, Italian and Portuguese. You can choose one as the default language or choose two or more to make languages switchable. If you have a lot of PDF files to convert, you can choose batch convert mode that can batch convert multiple PDF files into multiple or a single flip book at one time. This useful convert mode will save you much time and improve efficiency. Make HTML format to turn the flipbook into a webpage for online viewing. Publish flip book in App format to view on Mac devices. Create mobile version that is workable on mobile devices like iPad, iPhone, Android phones. Once you publish the flip book, you and your readers can share it with others very easily. On one hand, you and your readers can send the site link of your flipbook to others via e-mail. On the other hand, you and your readers can share the appealing flip book via social networks such as Facebook, Google+ and Twitter. A-PDF to Flipbook Pro for Mac integrates Google Analytics to help you collect statistics of your animation flipbook. You will know how your publication performs, how many visits, how long readers stay on each page, which page gets most visits and so on. With these data, you can adapt your strategy to improve the book performance. One-time fee, no hidden fee or subscription fee. 1. Use defined logo and book title to show your corporate identity. 2. Choose template of different skin (color) and style or use customizable template. 3. Decide to open window in blank or self window. 4. Add background image for the flip book. 5. Add sound file (MP3) as background music, and define sound loops. 6. Define font type for the flipping PDF book. 7. Change and choose color for the font, icons, background and toolbar to refresh visual effect. 8. Enable or disable the function buttons like Full Screen, Help, Print, Download, Zoom, (Social) Share or Auto Flip. 9. Add "Help Content File" (Image or SWF only) to show help info for your readers. 10. Zoom function and vectorial content ensure a clear display. 11. Share the flipbook via e-mail or social networks such as Facebook and Twitter. 12. Auto flip mode to flip page automatically; set flip interval and play counts. 13. Choose language for the page flip book. 14. Choose hard cover for the flash flip book. 15. Show corner flip effect to indicate that readers can drag the corner to flip page. 16. Define book margins and proportions for the PDF page turn book. 17. Use right to left (for example, Arabic) or left to right reading mode. 18. Use Minime Style to view flip book in a small window with defined proportion instead of full screen. 1. Click buttons to watch video or YouTube video. 2. Enjoy the beautiful music while viewing book. 3. Print out the printable area as coupon. 4. Experience realistic page turn effect just like reading real books. 5. Turn page in different ways: Drag the page corner, click on page shadow, slide mouse wheel, enter page number, click on page control buttons, and control with keyboard arrows. 6. Navigate through the flipbook with thumbnail and table of contents. 7. Zoom to view clear content or view flip book in full screen. 8. Use auto flip mode to turn page automatically. 9. 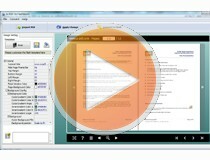 Share the flip book with families, friends and colleagues easily (via e-mail or social networks). 10. View the flip book anytime and anywhere with their iPad, iPhone, Android phones.